Music by Derek Bermel, lyrics by Wendy S. Walters, and directed by Johanna Mckeon. Sponsor / Funder Credits: Copland House and Peermusic. *These Actors are appearing courtesy of Actors’ Equity Association. Equity approved Showcase. Wendy S. Walters is the author of a book of prose, Multiply/Divide: On the American Real and Surreal (Sarabande Books, 2015), named a best book of the year by Buzzfeed, Flavorwire, Literary Hub, The Root, and Huffington Post. She is also the author of two books of poems, Troy, Michigan (Futurepoem, 2014) and Longer I Wait, More You Love Me. 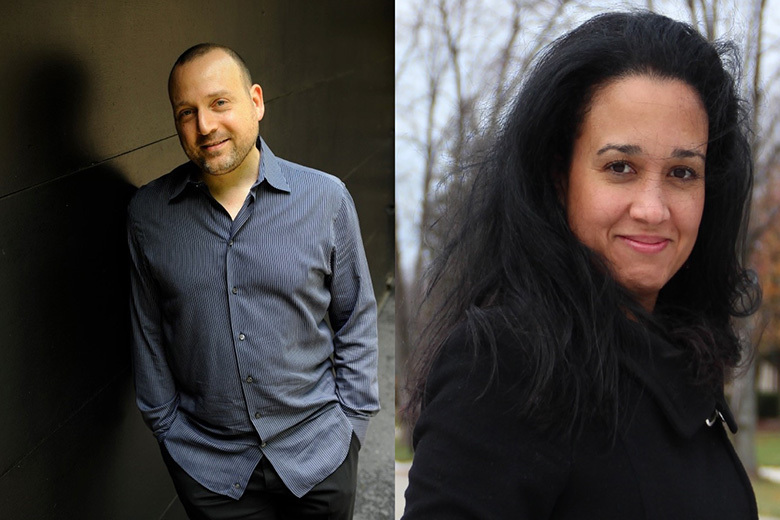 Walters has been awarded fellowships from Mass MoCA, New York Foundation for the Arts, The Ford Foundation, MacDowell, Yaddo, The Smithsonian Institution, and Bread Loaf. She is a founding director of Essay in Public | A Humanities Project, a Contributing Editor at The Iowa Review and serves on the board of the international writers’ conference NonfictioNOW, most recently held in Reykjavík. Her work has been published in The Normal School, Fourth Genre, Flavorwire, and Harper’s among many others. GRAMMY Award-nominated composer and clarinetist Derek Bermel is Artistic Director of the American Composers Orchestra, Director of Copland House’s Cultivate, and curator of Gamper Festival at Bowdoin Music Festival. He has premiered and performed as clarinetist on four continents and has collaborated with a dizzyingly eclectic array of artists and received commissions globally from the Pittsburgh, National, Saint Louis, and Pacific Symphonies, Los Angeles Philharmonic, St. Paul Chamber Orchestra, Chamber Music Society of Lincoln Center, WNYC Radio, Tanglewood, eighth blackbird, ASKO/Schoenberg Ensemble/Veenfabriek (Netherlands), the Guarneri, and JACK String Quartets, and violinist Midori. His many honors include the Alpert Award in the Arts, Rome Prize, Guggenheim and Fulbright Fellowships, American Music Center’s Trailblazer Award, and an Academy Award from the American Academy of Arts and Letters; commissions from the Koussevitzky and Fromm Foundations, Meet the Composer, and Cary Trust; and residencies at Yaddo, Tanglewood, Aspen, Banff, Bellagio, and Copland House. He will serve as the Seattle Symphony’s composer-in-residence during the 2018-19 season. Johanna McKeon’s Broadway Associate Director credits include War Paint, Hedwig and the Angry Inch (Tony Award for Best Musical Revival), American Idiot, and Grey Gardens. Broadway tours: Hedwig and the Angry Inch, American Idiot, Rent. Directing credits include Tokio Confidential (Atlantic Stage Two); Anne Washburn’s I Have Loved Strangers (Williamstown Theatre Festival and Clubbed Thumb); Mona Mansour’s Unseen (Old Globe, St Louis Rep workshops); Comedy of Errors, Schmoozy Togetherness (Williamstown Theatre Festival); The Rise and Fall of Annie Hall, Much Ado About Nothing, The Taming of the Shrew, Cymbeline (Vineyard Playhouse); Semi Permanent (NY Fringe Festival Award for Outstanding Solo Show); Functional Drunk (Ontological-Hysteric Theater); and Hatful of Rain (ITS Festival Warsaw). Her first feature film Auld Lang Syne won the Audience Award for Narrative Feature at the Indie Street Film Festival in 2016. Guest Faculty: Bard College, Strasberg Institute. Fellowships: Drama League, Boris Sagal and Fulbright. MFA, UT Austin. Choreographer and Dancer Kyle Marshall is a 2018 Bessie Award winner and a NJ State Council of the Arts Fellow. His dance company, Kyle Marshall Choreography (KMC), sees the dancing body as a site for celebration, an igniter of social change, and a container of history. KMC has performed at venues including Jacob’s Pillow Inside/Out, Joe’s Pub at the Public, Actors Fund Arts Center, NJPAC, NYC Summerstage, Wassaic Arts Project, and Conduit Dance. Commissions have included "Dance on the Lawn" Montclair's Dance Festival, NJPAC, and Harlem Stage. Presently, Kyle dances with the Trisha Brown Dance Company. He has worked with doug elkins choreography etc.,Tiffany Mills Company, Heidi Latsky, 10 Hairy Legs, and assistant choreographer David Neumann on the Total Bent at The Public Theater. Kyle is a graduate of Rutgers University with a BFA in Dance.